Your Island Adventure Begins With The Dairy Isle! At Dairy Isle, we are passionately committed to providing flavorful and delicious treats and meals! Located adjacent to The Keys and right down the street from The Monument, Diary Isle is a magnet for hundreds of tourists looking for a fast and affordable meal! You can relax and enjoy a home-made waffle cone topped with a delightful serving of our beloved ice cream. In the mood for something savory instead? Our extensive menu also includes Burgers, Sandwiches, Smoothies, Starbuck's Coffee and our Famous Crazy Fries! Enjoy your selection in our cozy and dazzling dining area, or take your treat outside and grab a table next to the huge kid-friendly Sand Box where your tots can enjoy playing on our Dairy Isle Dingy or our Isle Jet Ski! Our menu is family-friendly and impossible to beat, so stop in to The Dairy Isle for a tasty and scrumptious treat! 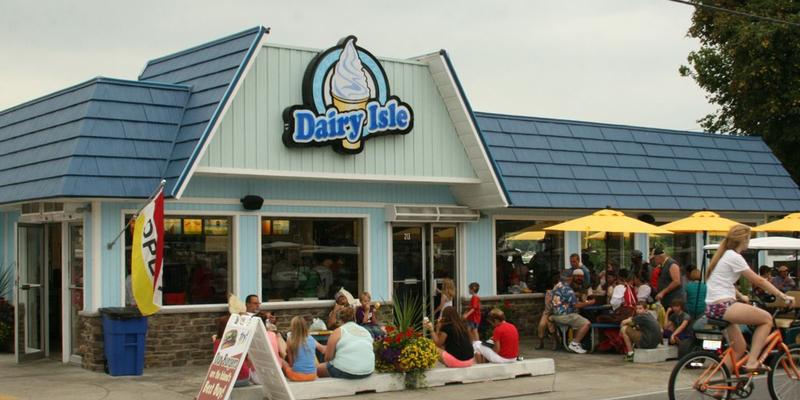 The Dairy Isle allows you to enjoy delicious ice cream treats while enjoying the beautiful Put-In-Bay!